Royal Bank of Scotland has released for sale its former office and data centre site at Dundas Street in the heart of Edinburgh. The area commands some of the highest residential values in the UK outside London. New Town North “offers a rare opportunity to create a new ‘quarter’ for the city, extending the New Town and taking advantage of Edinburgh’s unprecedented economic growth over recent years,” according to marketing agents Cushman & Wakefield. 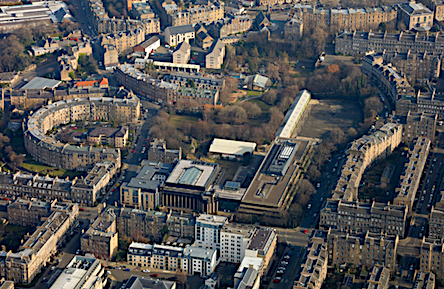 New Town North is the largest development site remaining in central Edinburgh . A concept master plan has been developed for over 409,000 sq ft of development, with landscaping and pedestrian-friendly public spaces. There are also 228,000 sq ft of existing high-quality office and data centre buildings already on site, capable of being refurbished or reused. An RBS spokesperson said: “We are excited by the marketing launch of New Town North, which is an exceptional opportunity to redefine this site as a striking new neighbourhood in Edinburgh. James Thomson of marketing agents Cushman & Wakefield added: “Opportunities to complement a design icon are very rare. “New Town North will be the natural extension of Edinburgh’s New Town, and a fantastic chance to create a premium development in the city centre. In the past, the New Town North area has had a number of uses – it was once home to St Bernard’s Football Club and a grey hound race track. In 1978 RBS commissioned their first building on site, the office and data centre at 34 Fettes Row, with their final development on the site completed in 2009. RBS relocated staff from the site last year to its purpose-built headquarters in Gogarburn.